The PARTNER EQUO (pat. #US9457481 B2), featuring articulated arms and special gripping tools, is ideal for handling manufactured products with an off-set center of mass compared to the vertical axis of the manipulator arm. The modular structure has been designed to resist the torsion from stress. The PARTNER EQUO can also be used in particularly narrow environments. The cylinder force is controlled through two pneumatic circuits. The first one always keeps the weight system balanced; the second always keeps the weight load balanced. The operator can change the load level by applying a minimum force on the gripping tool or directly on the load. Dalmec can manufacture the PARTNER EQUO in stainless steel. The manipulator and its gripping equipment is built for cleanliness in the pharmaceutical, food, and chemical industries, as well as other sterile environments. The structure is developed using AISI 304 stainless steel with a few parts in AISI 420/421. Welding is mostly performed using MAG and MIG methods in an inert gas atmosphere; major welds, from an aesthetic and functional standpoint, are ground and smoothed. Visible surfaces are polished and brush-finished. 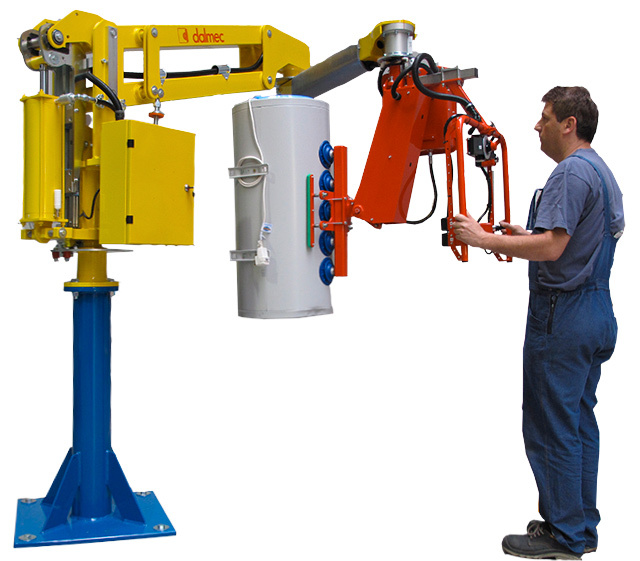 The inox PARTNER EQUO, fitted with suitable gripping systems, is able to lift and handle a variety of different loads. Dalmec can supply the pneumatic manipulators in an explosion-proof version in conformity with ATEX Directive, suitable for the installation of the manipulator in explosion-risk environment classified as zone 1 or 2. The manipulators for the handling of bags and boxes equipped with electric pumps are also included. The certification is made in our plant by the qualified Engineer of a Notified Body according to the ann. IX 94/9/EC-ATEX Directive, which ensures the total conformity of the manipulator with the Directive. Allows for a fast presetting of the load balancing effect in case of weight change. Allows for the lifting and handling of the load in a quick, precise and linear way, without any adjustments, by simply manipulating a lever control. Allows for the load balancing by manipulating a pneumatic push button after lifting the load through a lever control. Allows for automatic load balancing without any adjustment, after having simply manipulated the gripping through proper controls. Learn more about Dalmec’s Partner Equo patent here.